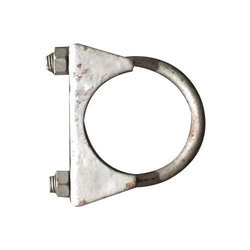 Pioneers in the industry, we offer muffler clamps from India. We are leading manufacturer and supplier of very high quality of Muffler Clamps to our customers. These products are available at very affordable market price to our most trusted customers. These products are highly appreciated by our clients for their dimensional accuracy and compact design. These products are manufactured from white zinc plated material to ensure superior quality. These products are offered with a unique sheet thickness and wide variety of different sizes as per the requirement of different automobiles. These products are widely used in various automobile industries because of their superior quality and flawless performances. Looking for Muffler Clamps ?